Our stately medieval hall makes a wonderful setting for your wedding, with its magnificent oak-timbered roof and wide tie beams. The room is framed by heraldic banners and five large candelabras that create a magical and romantic setting for your ceremony. Situated on the ground floor of Tamworth Castle, it is licensed for up to sixty people for a civil marriage or civil partnership. 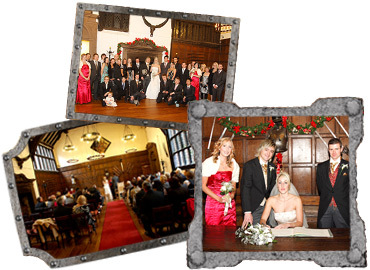 Download the Tamworth Castle wedding pack to find out more. Weddings take place at: 11.30am, 1.30pm and 3.30pm. Please note the registrar may change these times. To make a booking or for further details please contact the Wedding Coordinator by telephone, email or in person. A quick and simple booking form - including a terms and conditions form will be completed and you will be given a copy for your reference. Wedding bookings, appointments, viewings and enquiries can be taken on a Monday, Tuesday or Friday between 9am and 5pm. And on a Saturday and Sunday between 11.30am and 5.00pm. Deposit: Please note a £150 non-refundable deposit will be required at the time of the booking. You will have use of the Great Hall for approximately two hours. This includes half an hour for your guests to be seated, half an hour for the wedding ceremony and an hour to take photographs. The Great Hall will be set out with 60 chairs for guests, 30 each side of a burgundy aisle carpet consisting of five rows of six chairs. The chairs are attractive dark wooden with burgundy seat cushions. Ribbons and posy like flowers (provided by you) can be tied to the aisle chairs if you wish before the ceremony. A grand medieval inspired throne chair is provided for the bride and groom. These can be used to decorate the venue. The wedding coordinator will be able to give you guidance on decorations. any decorations need to be provided and positioned by the bridal party and will need to be removed after the ceremony. A red Aisle carpet is provided. To help create a wonderful ambiance on the day, approximately 80 candles will be lit in the Great Hall. These are the only candles which can be used during the ceremony. The Great Hall has wonderful acoustics for music to accompany your big day. any music needs to be chosen and supplied by the bridal party. However it doesn't have to be a CD or recorded music; it can range from live music such as a harpist, bagpipes, string quartet, singer, piano player to recorded music and the Castle stereo is available for you to use. A member of the bridal party will need to play this music when it is needed. There are a number of rooms available for you to have your photographs taken. There are two upper rooms - the Victorian Grand With-Drawing room or Tudor Dining Chamber, the Great Hall (generally in bad weather) and the Medieval Courtyard. These beautiful rooms, full of history and splendour, will add something special to your photography. Photographs can also be taken in our beautiful Castle Grounds, which have spectacular views over the River Tame and beautiful flower beds, packed with colour (season dependent). Please be aware that the grounds are open to the general public through out the year and there may be other wedding parties or event going on. The floral displays in the grounds around the bandstand give a wonderful backdrop to your photographs, but please bear in mind when they are being replanted from spring bedding to summer, and summer to winter, we unfortunately cannot guarantee that flowers will be there at the time of your wedding. The grounds are also used for other outdoor events which could mean increased members of the public, fuller car parks and additional noise. Please visit the Assembly Rooms website to see when outdoor events are taking place.